The return of NFL football kicks into full gear this week and Thursday’s action kicks off with a battle between the Minnesota Vikings and the Buffalo Bills. Preseason games are a time for teams to find out exactly who will be playing for them, whether it be specialists, rotational guys, or full time starters. Below, PFF’s team of analysts have all the most important position battles and players to watch during today’s game. The biggest position battle up for grabs on the Vikings roster this preseason will be the running back position. Second-round pick Dalvin Cook looks like the most likely to win the position battle ahead of veterans Latavius Murray and Jerick McKinnon. 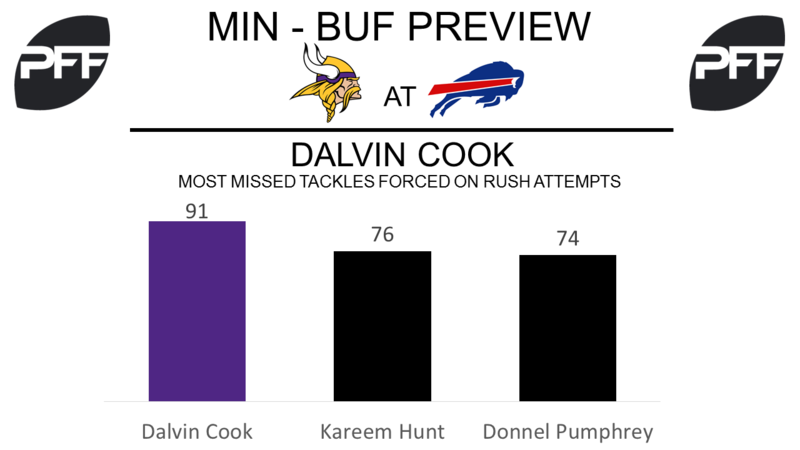 HC Mike Zimmer is notorious for keeping rookies on the bench, but Cook was outstanding at Florida State last season, earning an overall grade of 89.5, and he led the nation in elusive rating (128.1) and broken tackles (91). Murray brings a physical element to the run game, as his 2.6 yards after contact per carry ranked 12th among qualifying running backs last season, and he could be the Vikings short yardage back as he has shown an above average ability to get extra yards. In 2016, he ranked 12th in the NFL in percentage of short-yardage carries that generated yards after contact at 74.5 percent. (Short Yardage Situations = three yards or less from first down or touchdown). With Adrian Peterson signing in New Orleans and Matt Asiata joining the Lions, McKinnon is currently the most tenured Vikings running back. 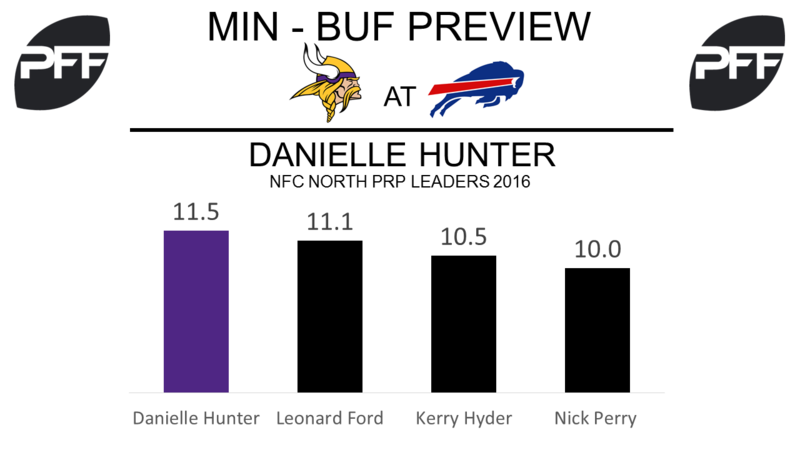 McKinnon is a better receiver than a runner, earning a receiving grade of 67.4 last season opposed to his 50.8 run grade. Keenum looks the most likely to open the preseason as the No.2 quarterback behind Sam Bradford, at least until Teddy Bridgewater returns to full health. Keenum started 13 games over the last two seasons for the Los Angeles Rams. In the 2015 season Keenum had an overall PFF grade of 74.5, and while Keenum had his struggles throughout the 2016 season, the Rams’ offensive problems lied much deeper than him. Keenum is still capable of being a high-percentage passer in the right situation, and his creativity outside the scheme is still a plus. Keenum has typically been good when kept clean, but a disaster when pressured, with a passer rating of 51.7 under duress. He has been accurate, with his past three seasons topping 70 percent in adjusted completion percentage. 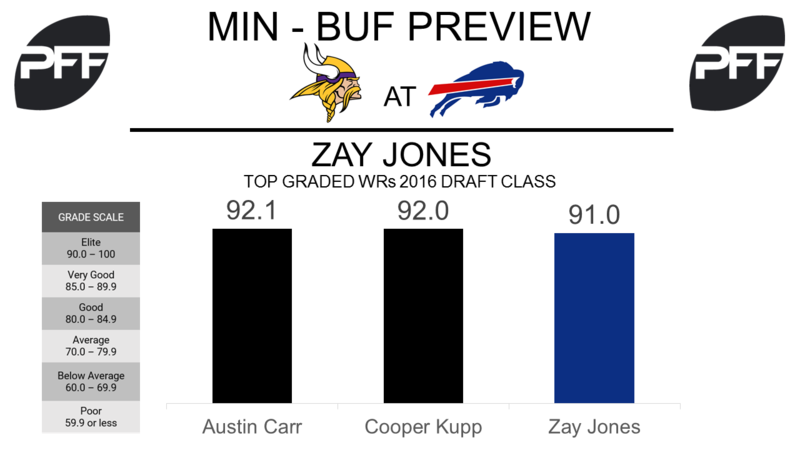 Much was expected of the Vikings first-round pick last season but he failed to establish himself as a rookie, playing only 79 snaps and earning just three targets in nine game appearances. Entering training camp, Treadwell looks set to be wide receiver No. 3 behind Stefon Diggs and Adam Thielen as the second-year receiver has continued to run exclusively with the first-team offense in three-receiver sets at training camp. Treadwell should definitely see more reps early in the season due to the suspension of Michael Floyd for the first four games. Treadwell only managed 0.33 yards-per-route-run last year, which was the lowest of any rookie wide receiver with more than 45 snaps in route a season ago, a far cry from his 2.44 yards per route run during his last season at Ole Miss (2015). Vikings QB Bradford averaged just 7.0 yards per pass attempt (21st in the league) last season, in large part because his average depth of target (6.6) was shortest in the league. The successful development of Treadwell would go a long way towards improving those numbers and elevating the Vikings’ offense in 2017. The team’s third-round pick out of Ohio State showed a lot of versatility during his college career, lining up at both guard and center. It will be interesting to see just where the Vikings plan on using him, we should get a good indication of this during the preseason. Elflien played all 13 games at center last season and only allowed 16 total pressures, he allowed one or fewer quarterback pressures in nine of 13 games and his 83.8 run-blocking grade in 2016 was second-best among all FBS centers. It could be argued though that Elflien enjoyed his best form at guard, registering an 82.5 overall grade two seasons ago, recording six “perfect” pass-blocking games (0 QB pressures) aligned at guard in 2015. Hunter looks set to move into a starting role for the Vikings defense entering the 2017 season. Hunter impressed last season, being used predominantly as a pass-rush specialist in 2016. His overall PFF grade 79.8 ranked 32nd among edge defenders. Hunter only played 603 total snaps last season (413 pass rush) which was only 58.1 percent of the Vikings total defensive snaps. He was one of the most productive pass-rushers on third downs last season and his third down PRP of 15.2 ranked sixth among all edge defenders with at least 200 pass rush snaps. He earned 29 of his 55 pressures on third down and converted 34.5 percent of those into hits or sacks. Right tackle appears to be the biggest position battle for the Buffalo Bills. The current projected starter is Jordan Mills, who started all 16 games there last season but his production wasn’t great. His spot is in jeopardy after the Bills selected Temple T Dion Dawkins with the 63rd overall pick in the second round of the 2017 NFL draft. Last season, Mills graded as the 56th best tackle among 77 qualifying tackles with an overall PFF grade of 56.5. Whereas Dawkins ranked 19th among 315 qualifying tackles last season with an overall grade of 86.4. Veteran tackle Mills was one of the worst pass-protectors in 2016, his 57 total pressures were the fifth-most among tackles with a minimum of 179 pass block snaps. His pass-blocking efficiency (PBE) of 91.9 ranked 66th among 74 tackles (PBE measures pressure allowed on a per snap basis with weighting towards sacks). Dawkins on the other hand had a PBE of 98.4, ranking third among draft-eligible tackles last season. He gave up two sacks and surrendered just nine total pressures on 443 pass block snaps in 2016. Jones will enter his rookie season as one of the most productive receivers in college football history. Jones set the FBS record for most receptions in a single season with 158 in 2016, he ranked third among draft-eligible wide receivers with a 91.0 overall grade. Jones look set to take the No.2 receiver spot behind Sammy Watkins after beating out a number of fellow receivers including Corey Brown, Rod Streater and Andre Holmes. Jones flashed a well-rounded skill set while playing in college, ranking inside the top-25 in yards per route run (2.96), drop rate (3.66), deep pass receptions (12), and deep receiving yards (429). But perhaps his most notable work came from the slot, where he ranked third in the FBS in yards per route run at 3.41 and eighth in slot receptions with 64. The rookie quarterback looks like the best option for the Bills backup QB job following the offseason trade of Cardale Jones and the free agent addition T.J. Yates. It will be interesting to see how well he plays in preseason, as he could be thrust into the starting job during the season if Tyrod Taylor underperforms. Peterman ranked seventh among draft eligible quarterbacks with a 66.1 adjusted completion percentage while under pressure in 2016 and his 114.7 passer rating while under duress was second in the class. Peterman threw for nine touchdowns and surrendered just one interception while pressured in his last year at Pitt. 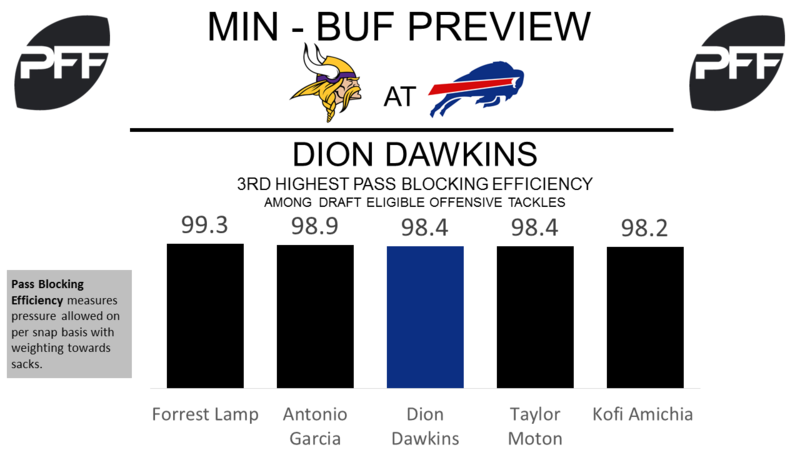 The Bills could feature a whole new linebacker group following the offseason departure of Zach Brown and the poor performance of Preston Brown, who ranked as the 68th best linebacker last season with an overall PFF grade of 45.9. Ragland was the team’s second-round pick in 2016 and missed his entire first year due to a shoulder injury. In his last year at Alabama, Ragland graded as the seventh best off the ball linebacker in FBS with a grade of 87.8. Hodges was productive across all areas last season, ranking among the top 16 at inside linebacker in run-stop percentage (9.3), tackling efficiency (10.6), and coverage snaps per reception (12.0). The Bills first-round pick is expected to contribute in a big way in 2017 following the loss of Stephon Gillmore, White should take over as the No.2 cornerback behind Ronald Darby. With a PFF overall grade of 89.9, White was ranked as the fourth highest draft eligible cornerback and was ranked second in terms of coverage grade among draft eligible corners with a grade of 89.8. In the SEC, White led all cornerbacks with 12 passes defended, ranked second in percentage of catches allowed with 42.6 percent, allowing 26 catches on 61 targets and ranked fifth with an NFL passer rating of 61.0 for targets into his coverage.